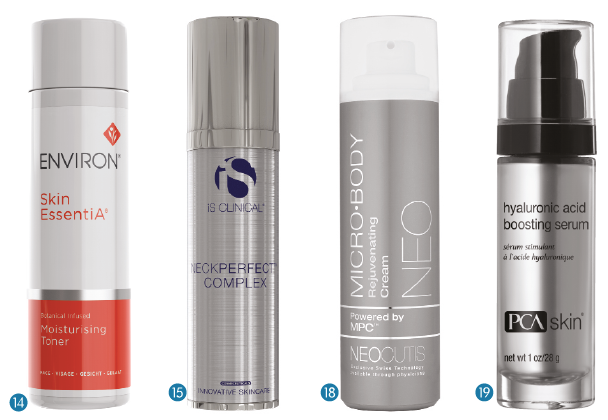 It seems as if 2017 is shaping up to be the year of the cosmeceutical, due to the rising preference for physician-dispensed products over non-prescription and OTC products, and a bevy of new launches from popular brands, as well as new brands entering this expanding category. There is a clear preference for new entries that are focused on product differentiation to expand the market from garden variety cleansers and moisturizers to science-based formulations, targeted anti-agers, beauty supplements and drinks, probiotics, and advanced treatment products. Consumers are seeking products that outperform their expectations and fit the bill of innovative problem-solvers that are convenient to use at home. Among the crop of ingredients that are making a lot of noise, we are seeing more hyaluronic acid, plant stem cells, botanicals, charcoal, and other naturals and organics. Patches, sheet masks, and silicone based topicals plus customized skin care products and home use devices are also on trend this year. 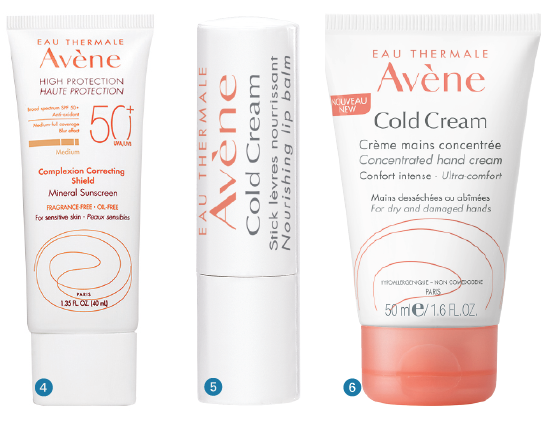 Although facial skin care still reigns supreme, products that specifically target the lips, neck, body, décolleté, and hands are picking up steam among the professional skincare buyer as well. 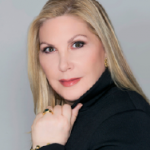 Therapeutic haircare is another rising star to watch, and topical products for intimate use are starting to show up at conferences worldwide. 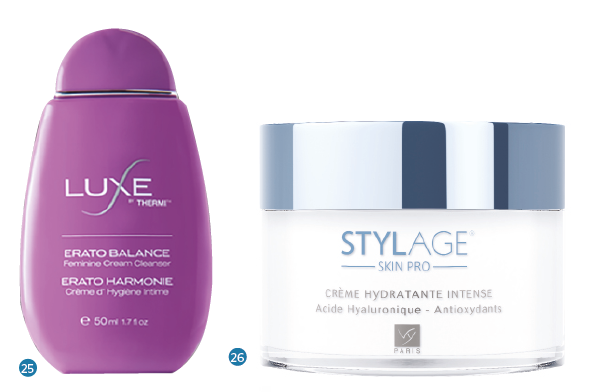 Topical hyaluronic acids have also earned their chops as a must-have cosmeceutical. 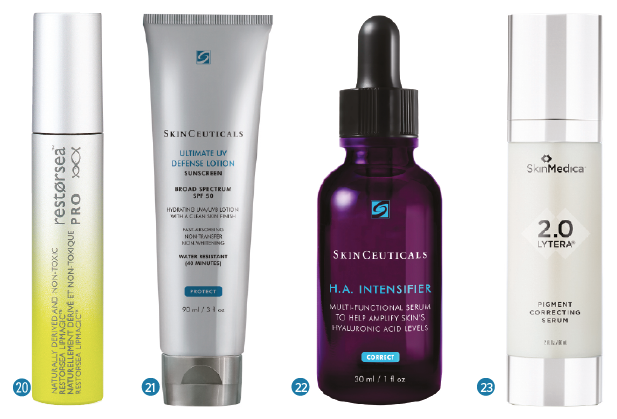 ‘We use Skinmedica HA-5 and recently added the Skinceuticals HA Intensifier. We apply these immediately post injection of Botox and fillers and patients continue these topicals. They enhance the outcomes of injectables,’ says Dr. Narurkar. He adds that a large segment of his patients want ‘natural’ cosmeceuticals but still demand efficacy. ‘The Restorsea Pro line has shown some of the highest loyalty and retention. 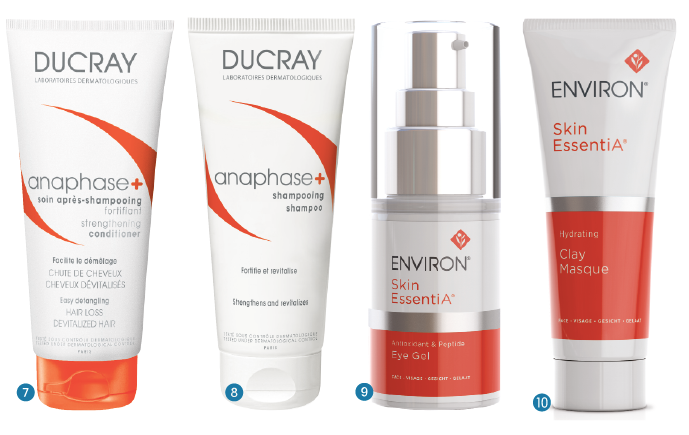 It is our go to cosmeceutical in patients with rosacea, atopic dermatitis and sensitive skin. The hydrolyzed salmon roe, which is the active ingredient, has been shown to improve cell turnover,’ he says. We tracked down some of the year’s new entries with an eye to what’s coming next. 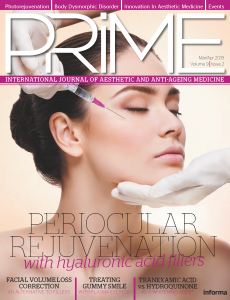 The stem cell-based technology in Provoque has been shown to reduce the appearance of lines and wrinkles around the eye in as early as 14 days. Applied with a medical grade stainless steel roller ball to provide a cooling effect. This serum contains alpha-2-HS glycoprotein (fetuin), a molecule that is secreted in large quantities by young cells, and targets wrinkles/fine lines, loss of firmness, texture, and discoloration. HydraTint offers next generation wearable sun protection in a lightweight oil-free formula that absorbs quickly and has a subtle, universally flattering tint suitable for all skin types and tones. The silky formula doubles as a primer for under makeup. A hydrating medium to full coverage formula that contains titanium dioxide and zinc oxide plus vitamins E and C, glycerin, sodium hyaluronate, in three shades to compliment most skin tones. Water-resistant formula for dry, damaged lips provides hydration effect lasting 6 hours after application. ves leaving a protective lipid film on hands for up to 6 hours. Hairloss supplement that prepares the scalp for hairloss treatment such as minoxidil, containing tocopheryl nicotinate, Vitamins B5, B6, B8 (Biotin), monolaurin, hydrolyzed wheat proteins and ruscus. Fortifying and detangling conditioner with hydrolyzed wheat proteins, vitamins B5, B6 and B8 (biotin). Energizing gel formulation that improves the appearance of photo-damaged skin with a rich blend of Vitamins C and E, peptides and low levels of Vitamin A to address the signs of aging skin. Non-oily, pH balanced lotion designed to increase hydration and improve uneven skin tone with a blend of plant extracts, vitamins and antioxidants. Contains a blend of hydrating ingredients and natural clay to help eliminate excess oils and exfoliate for a refined complexion. 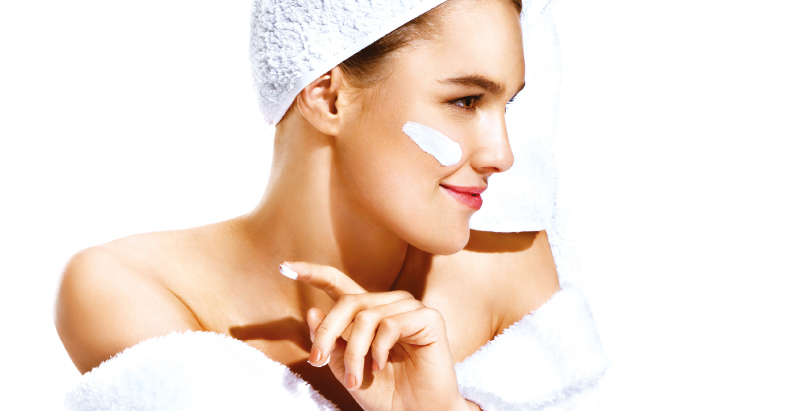 After application, the masque becomes transparent and can be left on for 10–20 minutes or overnight and then rinsed off with water. product received the Skin Cancer Foundation Seal of Approval. Contains Sepiwhite™ (a compound of essential amino acids and lipid residue), niacinamide, vitamin B3, marine algae complex, mineral complex, and red algae, with 3% avobenzone; 10% homosalate; 5% octisalate; 10% octocrylene, and Aquaxyl™ Plant Sugars. 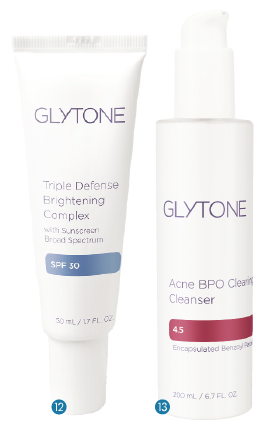 With 4.5% encapsulated benzoyl peroxide, this acne-fighting cleanser kills surface acne bacteria and is gentle enough for daily use on all skin types. Luxurious cooling treatment that refreshes skin and provides soothing hydration, featuring natural botanical antioxidants centella asiatica, green tea, aloe vera, and rosemary extracts with botanically sourced hyaluronic acid. Targets the neck, jawline and décolleté to diminish the appearance of lines and wrinkles and improve skin tone and texture. Contains a combination of fruit acids and White Willow Bark Extract, Prunus Amygdalus Dulcis (Sweet Almond) Seed Extract, Hyaluronic Acid, Hydrolyzed Rice Protein and Calcium Pantothenate (Vitamin B5) to help stimulate collagen production and cellular metabolism. 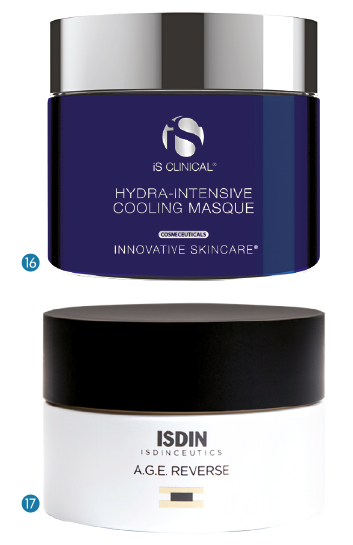 This formulation from ISDIN, a newcomer to the US market, protects skin from pollution with Exo-P, moisturizes with reticulated hyaluronic acid and ultraglycans and slows the formation of AGEs with carnosine. A rich yet non-greasy body cream containing salicylic acid to smooth dry, rough skin and target aging skin with body-rejuvenating ingredients, including ceramides, hyaluronic acid, petrolatum and glycerin for all over hydration. This potent hyaluronic acid boosting serum works on three levels: on the surface, deeper in the skin and by increasing the skin’s own hyaluronic acid production. Contains hyaluronic acid and sodium hyaluronate, hydrolyzed hyaluronic acid, HA-Pro Complex — PCA SKIN’s proprietary blend that works to stimulate the production of the skin’s hyaluronic acid, plus ceramides and niacinamide. This lip plumper contains Aquabeautine XL® (INCI: hydrolyzed roe), vitamin C, licorice leaf extract, soybean seed extract and palm oil to work on the outer layer of skin, gently and without irritation for smoother, plumper-looking lips. This new lotion absorbs instantly for continuous hydration, with a blend of zinc oxide and chemical filters for effective broad-spectrum UVA/UVB protection at SPF 50. 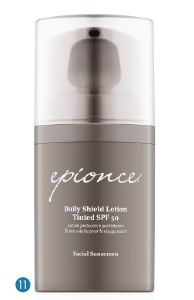 Includes hyaluronic acid for all-day hydration and silica technology to control sweat and oil. A multi-beneficial formula containing a high concentration of pure hyaluronic acid (HA), Proxylane™ and purple rice extract to help renew plumpness, elasticity, and firmness. Works to stimulate hyaluronic acid production in skin and prevent depletion for reduction in the appearance of crow’s feet, nasolabial folds, and marionette lines. Featuring a new formula that is both hydroquinone and retinol-free, and contains tranexamic acid, phenylethyl resorcinol, niacinamide and tetrapeptide-30, a marine extract blend and phytic acid for advanced skin brightening results. This two-step system can be used as a topical solution for everyday lip enhancement and/or as a companion to dermal filler injections. 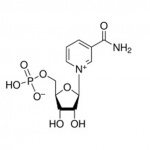 Also contains benzyl nicotinate, an ingredient proven to increase microcirculation. This pre and post procedure duo consists of Erato Balance Feminine Cream Cleanser and Erato Elixir Feminine Moisturizing Treatment. The cleanser is pH neutral and contains organic extracts of plants from the Swiss Alps with a blend of mallow extracts and bisabolol. The moisturizing treatment is formulated with essential fatty acids, biosaccharides and hyaluronic acids to soften the vaginal mucosa. This rich moisturizer contains the VIVASÔME® Complex, anionic polysaccharides including hyaluronic acid, stabilized vitamin C, Unitamuron H-22, Uniprosyn PS-18, and Syn®-Ake, which help to relax facial muscles for long-lasting hydration. Packaged in a patented airless jar with a soft touch and slide pump to prolong the duration of usage. Non-greasy, quick-drying sunscreen delivers superior protection (80 minutes) outdoors and contains glycerin to replenish l ipids and restore the skin barrier function. 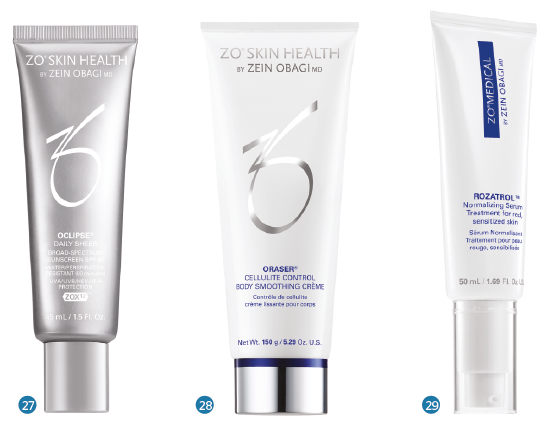 Water- and perspiration-resistant, the formula also contains ZOX12™ — a 12-hour, time-release antioxidant complex that fights free radicals. This new crème offers instant firming effects and textural improvement, reducing the appearance of cellulite. Formulated to help improve microcirculation, reduce skin contour, encourage the production of collagen, and restore hydration. Daily treatment serum targeting red, sensitized skin by reducing excess oil and inflammation. An enzymatic exfoliator provides ultra-mild exfoliation, while amino acids support optimal microcirculation to prevent the signs of aging skin.